It got properly muggy today for the first time this year; at work, we were all unplugging the phone and laptop chargers and plugging in the fans. I got in this morning to find three cucumber plants by my chair and a parish magazine ("The Sprout") on my work scanner. I felt well village. My work scanner is old and slow, but not broken, unlike my home scanner, which is now stuck permanently on the dreaded Dell invalid ink cartridge error. No amount of power cycling, jiggling, or inserting another completely valid Dell ink cartridge (I only have completely valid Dell ink cartridges) will shift my Dell all-in-one from the terrifying conviction that I am monstering it with a knock-off cartridge, and must perforce be prevented from using the scanner (I only ever use the scanner) until I have restored its entirety with a new and intact printer cartridge. The scanner had an irritating judder in the bottom left-hand corner, so I probably should have replaced it ages ago, but still. List of things I am never going to buy again: an all-in-one, a Dell Printer, anything by Dell. So, another significant purchase. After the Wardrobe and the Sofa (IKEA had finally exited their muesli and tears colour scheme phase and emerged into a world of bright block colour, so we had to take advantage) I have significant purchase fatigue. And also significant purchase build up, as along with the scanner, there's a long list including things like kitchen, mobile phone and car (all still just about functioning, though their last legs have long since become no legs). Still, the sofa is beautiful. 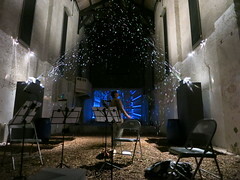 Above: visiting Music of the Spheres and Ladybird larvae by post. 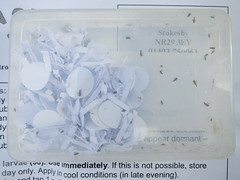 I thought I'd lost them all (there was a gust of wind when I was gently shaking them out of their box) but I looked at the rose bush that got the lion's share of the beasties today and all the greenfly are gone. The title of this post sounds like it should be sung, opera style. Ah yes; from the third act -- The Upgrade Cycle. The ladybirds seem to be enjoying themselves on our plants but it's not like the blackfly has gone - hopefully they are on their way out, sounds slower than your experience though. Maybe the larvae are more voracious than the adults? I did pretty much put almost all 50 of them on one plant. It does seem to have done the trick, but nowhere I put one or two (there were some stuck inside the case) are really showing any effect at all. My 3 in one printer scanner idiot has given up the ghost. I was using it as a scanner for ages but no amount of fiddling seems to work. You remind me that I should just admit defeat and bin it. It takes up a lot of space with it's hulking redundancy.